Despite the monsoon conditions last summer, which caused widespread flooding across much of the UK, the Tiverton Balloon Festival successfully raised £1,000 for each of our main charities: The Devon Air Ambulance Trust, Children’s Hospice South West and the Tiverton High School Mini-Bus Appeal. We also donated a further £1,000 to local clubs and organisations including the Tiverton Sea Cadets, Tiverton Air Cadets, Tiverton Police Cadets, Newton Abbot Heli-Club and the Avon Kite Flyers to show our gratitude for their participation and hard work during the 2012 festival. In addition to this the general public raised a further £1,783 for charity on the festival site, taking the overall total raised to £5,783. That’s why we are pleased to confirm that the much anticipated Tiverton Balloon Festival will be back for a third successive year. Once again we will be supporting the Devon Air Ambulance and Children’s Hospice South West, as well as many local charities and clubs. Preparations are well underway for the 2013 festival to be held on the combined Petroc College/Tiverton High School campus, which will feature the best from 2012 plus more! With up to 30 hot air balloon teams attending from all over the country, visitors will be able to watch the balloons take off in ‘mass ascents’, view the balloons up-close, participate in balloon inflation competitions and meet the pilots. There is also the opportunity to take a balloon ride over the beautiful Devon countryside with festival organisers ‘Aerosaurus Balloons ’. Along with live music acts, various main ring displays, ‘night glow’ displays, performing arts, inflatables, refreshments, a children’s play zone and various trade stands, the Tiverton Balloon Festival promises to be an awe-inspiring display of colour with something to suit everyone. We are also excited to announce the addition of a food and drink marquee offering award-winning local produce from the Westcountry. As with previous years there are plenty of opportunities for businesses, traders, local groups and individual volunteers to be involved in what is set to be a fantastic local event! 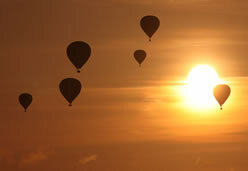 The Tiverton Balloon Festival 2013 will be taking place between Friday 12th July and Sunday 14th July inclusive, so get it in your diary now! If you would like to be involved, please visit www.tivertonballoonfestival.co.uk or contact the festival office on 01404 823735.